Please select an option Small Medium Large Xlarge 2xlarge Please select a Size. 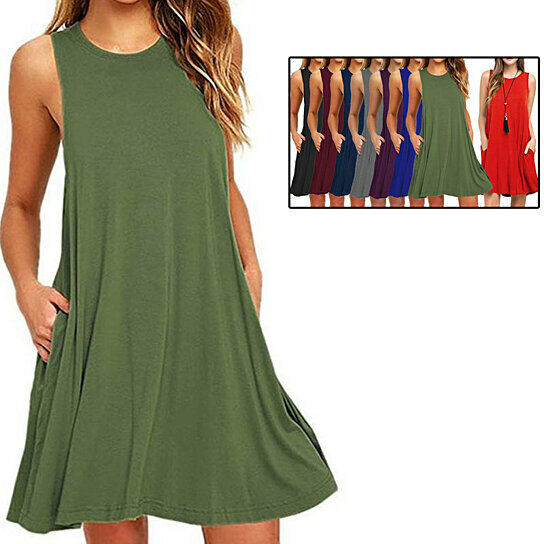 This long tank dress featured with 2 pockets at sides,swing style for a casual looking.This flowy solid dress is a perfect wardrobe for summer,you could wear this dress as a casual,everyday shirt. Made of Cotton/polyester fabric,comfy,soft and comfortable to wear. Size: Please check the follows size chart before add to cart.Or choose one size up than your usual if you like the loose style. X-Large: Bust 41.8", Length 34.27"
2X-Large: Bust 43.4", Length 34.67"